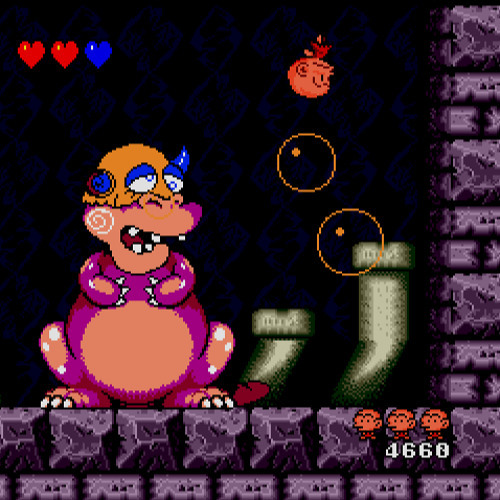 Though Bonk isn’t exactly a household name these days, there was a time when he was a relatively prominent mascot character for the TurboGrafx-16 console. The system would see no less than three different Bonk titles in its lifetime, the first of which was 1990’s Bonk’s Adventure. Though it may not be one of the best platformers of the 16-bit era (admittedly a difficult feat to accomplish), it still has a charm of its own, even if it hasn’t aged particularly well. 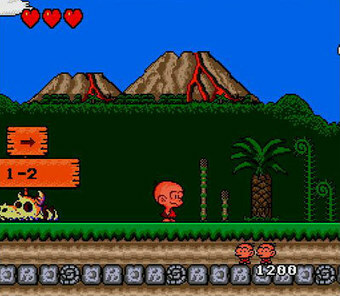 Bonk’s Adventure stars the titular Bonk, a young caveboy with a comically large head that’s as hard as a rock. Bonk is on a mission to save a dinosaur princess, and will have to use his thick noggin to take out enemies. 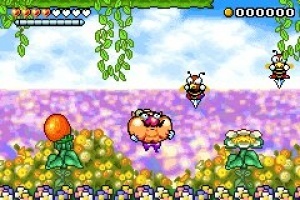 Whereas most platformers of the time simply had players jumping on enemies to defeat them, Bonk instead uses a headbutt as his signature attack. Bonk can headbutt enemies on the ground, or jump in the air to perform a diving headbutt. In a fun twist to platforming norms, Bonk’s regular jumps can only damage enemies if they are above him, as his head is harder than his feet. Bonk has three hit points to start with, which can be replenished in increments by finding fruits and vegetables, while small hearts will replenish an entire hit point, and large hearts refill all of Bonk’s health. 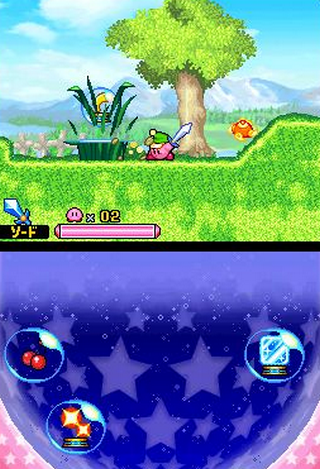 Meanwhile, two blue hearts are hidden in the game, and will increase Bonk’s maximum hit points by one. Additionally, Bonk can find pieces of meat, which serve as power-ups. 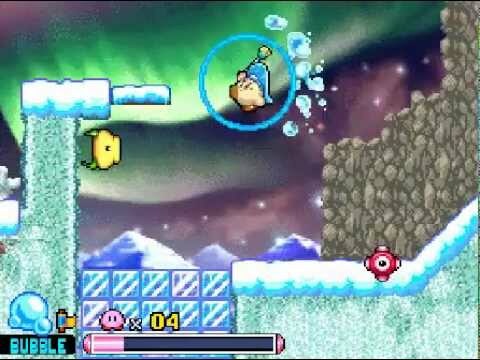 Finding one piece of meat supercharges Bonk, who can use his diving headbutt to stun all on-screen enemies (defying all logic, this includes enemies in midair). Finding a second piece of meat when powered up will send Bonk into a temporary invincibility. You can even skip the stacking and go straight to invincibility if you find a big piece of meat. The core gameplay is decently fun, though it must be said that Bonk’s movements and jumps feel slower than those of Mario or Sonic. If you’re used to the more popular platforming heroes of the era, then Bonk’s relatively slower controls have noticeably aged. Another downside is that the levels are incredibly basic. While there are some platforming challenges to be had, the levels really come down to little more than going from one end of the stage to the other. There are some fun ideas in terms of environments (including the belly of a dinosaur in an early stage), but the level structure never comes anywhere near the creative heights of Super Mario World or Sonic the Hedgehog. Visually, Bonk’s Adventure still holds up, with the graphics and animations possibly being the game’s highlight. The character designs are simple but colorful, and the environments are fun to look at. Best of all is Bonk himself, who has some hilarious animations. Bonk’s transformations when grabbing the aforementioned meat, as well as his death animation, are both done in a Looney Tunes-esque cartoony style. 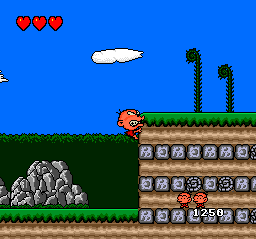 My personal favorite animation is when Bonk climbs steep walls, which he accomplishes by biting them with his teeth. Bonk’s Adventure also features some cute and catchy (if not entirely memorable) music. Once again, it can’t match many other platforming soundtracks of the time, but it fits with the game’s tone and simplistic nature. Suffice to say that Bonk’s Adventure hasn’t aged as gracefully as many of its 16-bit platforming peers. Though it’s not necessarily bad, either. It simply lacks the depth and creativity that platformers of the 90s were quickly becoming adept in, which ensured their timeless appeal. Today, Bonk’s Adventure may be a good place to start for younger gamers and platforming newcomers to get a taste for the genre. But for platforming veterans, it may feel a little too vanilla. With the exceptions of Super Mario Bros. and Tetris, there is perhaps no other game that has had such a longstanding influence as The Legend of Zelda. 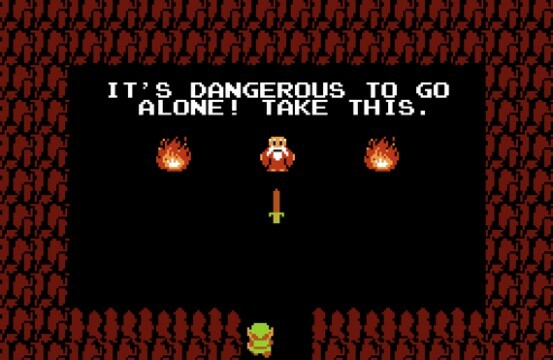 The 1986 NES title not only started one of gaming’s most heralded series, it also served as a forerunner for both the action/adventure and RPG genres, and can be seen as the originator of sandbox games, as Zelda introduced a greater sense of player freedom than what had been seen before. Though this trailblazing title remains fun in a number of respects, age has magnified how prototypical it was towards the greatness that would later stem from the series. As you would expect, The Legend of Zelda laid the groundwork for the series, with many of the franchise’s established elements showing up in more primitive forms. Link must traverse the land of Hyrule collecting weapons and items as he tackles dungeons to collect the eight pieces of the Triforce of Wisdom in his quest to save Princess Zelda from the evil Ganon. Later entries would add stronger storytelling into the mix, but the basic premise of the original makes for a more open gameplay experience. While there is a recommended order to tackle the game’s dungeons, player’s are actually free to take them on in any order they see fit. Those who have mastered the game can even face the final boss without gaining the sword! The Legend of Zelda boasted a level of freedom that was unheard of at the time, and as the series has become more story focused through the years, it’s easy to say this is the most open-ended Zelda title to this day. The dungeons are the highlight of the game. Every time Link steps into a dungeon, the adventure becomes more focused. 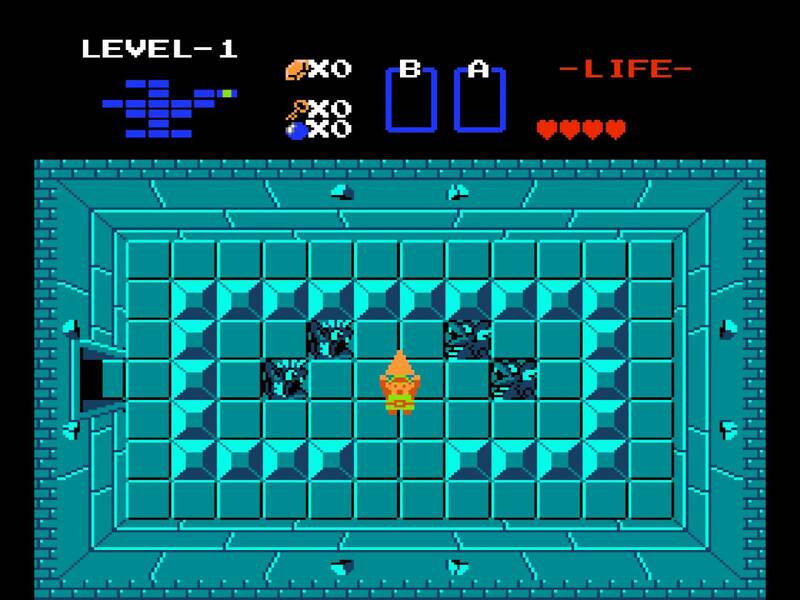 Take out enemies, collect the dungeon item, as well as the map and compass, work your way to the boss, and defeat it to gain a Triforce shard. The dungeons don’t take more than a few minutes, but they each feel like their own complete adventures. Traveling across the overworld is considerably less fun. Many of the areas look similar, other parts are maze-like, and others still serve as continuous loops unless you can figure out the required pattern to make it through. It can feel confusing and tedious. There are also barrages of enemies, many of which pop out of the ground as you’re passing by, making them difficult to avoid, and others who use ranged attacks that fly passed the entire screen. It’s just way too easy to die when you’re just walking around. There are fairy fountains scattered here and there to heal your health, which helps ease the difficulty a bit, but that’s when you can actually manage to make it to one. Combat is simple and fun, with the sword and various items being incredibly easy to use. Though Link’s limited movements of up, down, left and right can feel a bit stiff at times, especially when you’re bombarded by those aforementioned waves of enemies. The graphics have understandably aged, but remain charming. Meanwhile, the music is a highlight in NES soundtracks, and laid the groundwork for the legendary music of the series. As a whole, The Legend of Zelda can still provide some good, old school fun. But the difficulty can be frustrating, and it goes without saying that the elements it created were bettered a number of times over in the sequels. It doesn’t feel entirely obsolete when compared to its successors, however, due to its more open-ended nature, which gives it a unique flair for the series. Its unique place in its series means that it’s aged better than Metroid. But it also feels incredibly prototypical and “for its time” when compared to later entries, so it doesn’t boast the timelessness of Super Mario Bros. The importance of The Legend of Zelda is difficult to understate, but I’d be lying if I said it holds its own against other Nintendo greats. Its contributions to gaming are close to unrivaled, but there’s a reason why when people discuss the greatness of 2D Zelda games, they’re usually referring to A Link to the Past. Donkey Kong Country 3: Dixie Kong’s Double Trouble served as a fittingly great end to Rare’s Donkey Kong Country trilogy on the SNES. Though its release in late 1996 meant that it failed to reach the high sales numbers of its two predecessors due to the launch of the Nintendo 64 a few months prior, DKC3 retains the same sense of fun and style as the two preceding games in the series. Just as DKC2 took DK’s sidekick Diddy and made him the star, DKC3 does the same by putting Dixie Kong in the spotlight. The fact that DK was now far removed from the equation may have impacted the game’s sells all the more, but Dixie Kong is still the most fun Kong to control, not to mention she was one of the earliest Nintendo heroines to get a starring role. Dixie is joined on her adventure by Kiddy Kong, an infant gorilla who possesses the size and strength of Donkey Kong himself. Kiddy is admittedly a forgettable character (it shouldn’t be surprising that he’s never shown up in the series since), and his presence leads one to think that maybe Dixie and DK were the original planned duo, but since DK would have taken the spotlight, Rare whipped up a quick replacement instead. 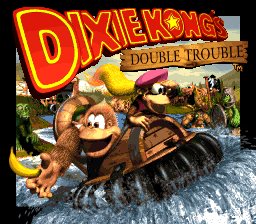 Despite Kiddy Kong not being a particularly memorable addition to the Kong family, his pairing with Dixie gives the game a good mix of the gameplay of DKCs 1 and 2. Dixie can still use her ponytail as a propeller to glide and make her jumps more precise. While Kiddy, having the strength of DK, can take out bigger enemies. The team-up moves from DKC2 return, with Kiddy being able to throw Dixie to great lengths and find out-of-reach secret areas, while Dixie can throw the hefty Kiddy to bulldoze enemies and break certain walls. It must be said that many of the situations of DKC3 are more specific to certain Kongs than the previous game, with a number of secrets only able to be found with Dixie’s gliding abilities. 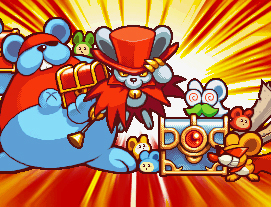 Kiddy’s strength comes in handy with finding a few of the game’s secrets, but his unique traits aren’t utilized nearly as often as Dixie’s. The game basically uses the same platforming gameplay of the past entries, and though the level design never reaches the heights of the second entry, DKC3 was still one of the best platformers of its day. The levels are creative and varied, with new twists and gimmicks added to the stages at an increasingly frequent rate as you progress further in the game. Animal Buddies also make a return, with Squawks, Squitter and Enguarde making a comeback with all their abilities from the second game. Rambi the rhinoceros has been replaced with Ellie the elephant, who’s cute, but her ability to carry barrels and shoot water with her trunk is never used in a way to make her as fun as the destructive Rambi. A new bird friend named Perry shows up, and simply flies overhead to grab objects the Kongs can’t. The boss fights have a similar variety to the levels, with each one presenting a different challenge (a few of them require you to combat them as one of the Animal Buddies). Though some boss fights, such as Bleak the snowman, end up being a little underwhelming, they are all at least more than just bigger versions of standard enemies. 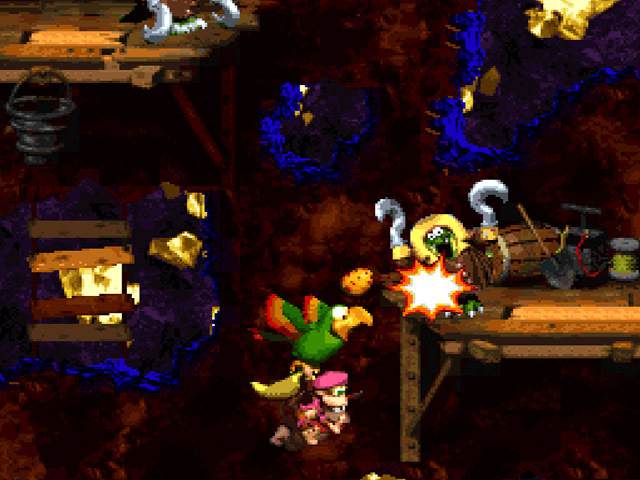 While the gameplay retains the same style as the other DKCs, where Donkey Kong Country 3 differentiates itself from its predecessors is its world map. Whereas the first two games presented more traditional platformer world maps, DKC3’s map is more flexible, as Dixie and Kiddy travel the “Northern Kremisphere” via boats, hovercrafts and jet skis to various islands, which serve as the game’s worlds. You gradually upgrade your vehicles via Funky Kong, with each new transport being able to take you further than the last. In an interesting piece of nonlinearity, the third and fourth worlds in the game are actually interchangeable (though it’s somewhat disappointing that those are the only worlds that are). Each world contains five stages and a boss. There are seven standard worlds plus one lost world. Though Funky is only found on the primary world map, Wrinkly Kong is found in every world, as is Swanky Kong. Wrinkly saves your game, while Swanky hosts a ball-throwing mini-game. Strangely, Cranky Kong’s only role in DKC3 is serving as your opponent in Swanky’s mini-games. New characters include the Brothers Bear, an extensive family of bears who show up in various points in each world. The bears will often have you trading unique items between them, or give you hints about some of the secrets of the game. 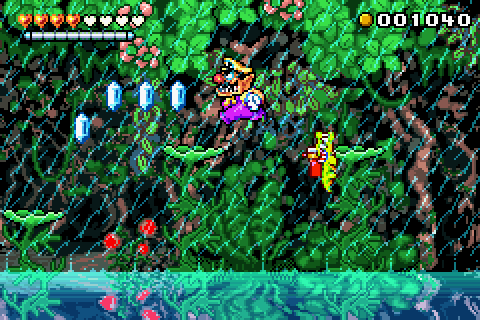 You can find Bear Coins throughout the levels (which replace DKC2’s Banana Coins), but strangely, only a couple of the bears and Swanky’s mini-games require them. 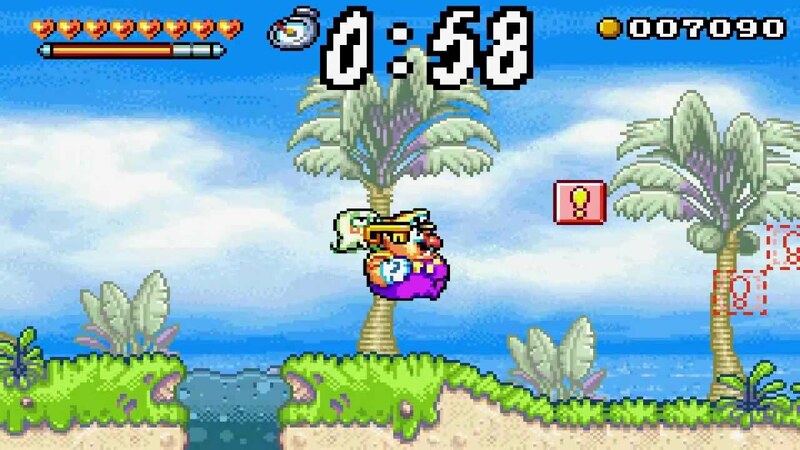 There are also Bonus Coins (replacing Kremkoins), which are won in bonus games and, just like in DKC2, are needed to access the secret levels in the Lost World. The DK Coins make a return, but with a twist. This time, instead of simply being hidden within the levels, they are guarded by a Kremling named Koin. Koin uses the DK Coin as a shield, leaving the player to find creative ways to take him down with a steel barrel. It’s a fun twist to the formula, but unfortunately, your prize for getting every last DK Coin almost doesn’t feel worth it. By the time you receive your reward, you’ve almost completed everything in the game, making it feel like it shows up long after it really would have been helpful. Finally, the last new item of note are the Banana Birds, which are hidden throughout secret caves on the world map. If you want to simply play through the game and beat the final boss, DKC3 is decently challenging, though the main quest isn’t nearly as difficult as DKC2. However, trying to complete everything kicks up the challenge considerably, and the secret levels are among the hardest in the series. To achieve full completion of the game, you’ll have to beat every bonus stage (every level has two, save for some of the secret levels, which have up to three), find every DK Coin, find every Banana Bird, complete every task for the bears, beat the game, and beat all the secret levels. In terms of content, it certainly packs a punch. By its own merits, Donkey Kong Country 3: Dixie Kong’s Double Trouble is an excellent platformer, and I can respect the argument that it’s a “deeper” game than the original DKC. However, DKC3 ultimately falls considerably short of the second installment for a few reasons. The first of these reasons being the game’s overall atmosphere. It’s true that the graphics are more polished than ever and the game’s scenery is beautiful (some of the best on the SNES), but the world of the Northern Kremisphere feels like a step back from the creativity of Crocodile Isle. Whereas DKC2’s world was a clash of the fantastic and the dreadful, DKC3’s world instead reverts back to the natural settings of the first game. Gone are the pirate ships, beehives and amusement parks of the last game. In their place are water, mountain and tree themed levels. It’s not that the setting is bad. Far from it, actually. But its world lacks the unique tones that the second game exuded. The character designs have also taken a nosedive in quality. It’s not just Kiddy Kong, but the enemies as well. 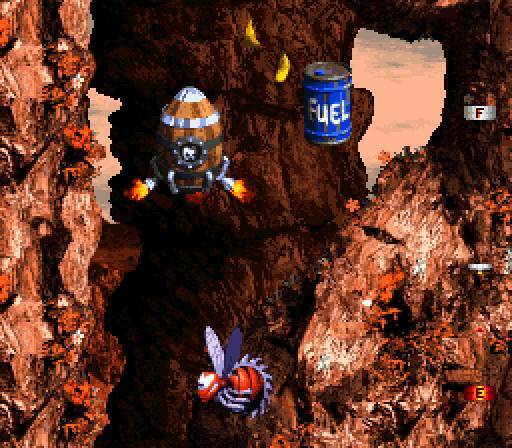 The original Donkey Kong Country didn’t exactly boast the most creative enemy designs, but they had a charm about them. 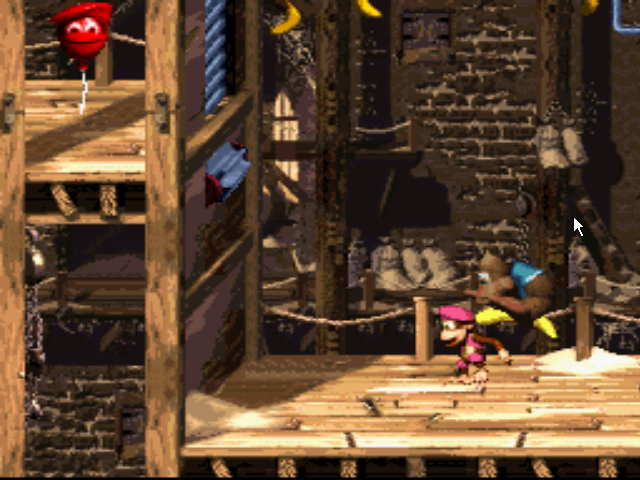 DKC2 upped the ante with more creative designs and an underlying pirate motif. DKC3 goes back to more of the generic enemy style of the original, but their designs lack the charm, and look more goofy than anything. The Kremlings even have a new leader in a robot named Kaos (though it shouldn’t be a surprise who’s behind the machine), but the robot theme is only reflected in the new mechanical bee enemies, the Kremlings themselves are, well, Kremlings. There’s an inconsistency in the art direction that just feels like a huge step back. Perhaps DKC3’s greatest sin as a follow-up to Diddy’s Kong Quest, however, is its soundtrack. Now, DKC3’s music is perfectly fine on its own. But considering the sheer heights that the last two games took video game soundtracks, being “perfectly fine” just doesn’t compare. The soundtrack, primarily composed by Eveline Fischer (regular series composer David Wise only contributed a few tracks) is a good mix of music, but it fails to create the atmosphere and moods that the other games in the series did so easily. 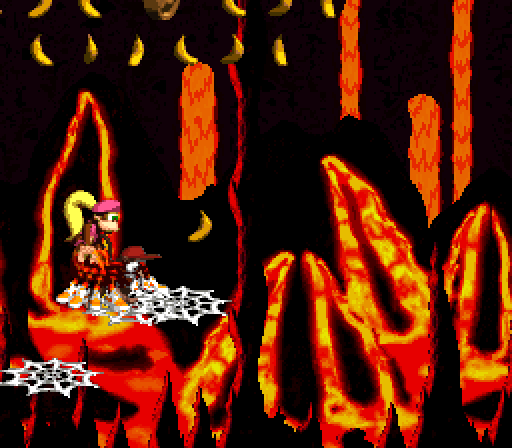 As a whole, Donkey Kong Country 3: Dixie Kong’s Double Trouble is an excellent platformer. The level design is great and varied, the gameplay is challenging and fun, the game still looks great, it sounds good, and finding every last trinket gives it a lot of replay value. Problems arise, however, with its inevitable comparisons to its immediate predecessor. Aside from the robust world map, DKC3 is structured very much like DKC2. But the game as a whole is never quite as good. As great as the levels are, they don’t match up to those of DKC2 in terms of creativity and challenge. The fact that it falls so far below its predecessor aesthetically also dampens the experience. DKC3 remains a more than worthwhile game in its own right. But the fact that it’s so similar to DKC2, yet inferior to it in so many ways, makes it feel like a hallowed out version of DKC2’s accomplishments. Even the subtitle of “Dixie Kong’s Double Trouble” is less clever than “Diddy’s Kong Quest” (I still don’t exactly know what the “double trouble” is referring to). With that said, even a hallowed out DKC2 is still more fun than most other games. Though it may not be as fondly remembered as its predecessors, Donkey Kong Country 3: Dixie Kong’s Double Trouble was a great send-off for Rare’s DKC series. When Donkey Kong Country became a massive success in 1994, it was inevitable that it would get a sequel. Little did gamers know that said sequel would arrive the very next year. With such a relatively short development time, DKC2 could have easily been little more than a cheap cash-in. Instead, it ended up being one of the greatest sequels in video game history, and twenty years later, it can still safely make that claim. The original Donkey Kong Country is a classic in its own right: It had revolutionary visuals, an unforgettable soundtrack, and some of the most fun platforming gameplay of its day. Still, there was room for improvement, with the overall experience being simple and straightforward when compared to something like Super Mario World, not to mention the dull boss fights. Donkey Kong Country 2: Diddy’s Kong Quest not only ironed out DKC’s rough edges, it also improved everything its predecessor accomplished, and added a sense of gameplay depth that makes it one of the few 2D platformers – if not the only 2D platformer – that could better Mario at his own game. The most immediate difference players will notice between DKC2 and the original is the absence of Donkey Kong. The subtitle of “Diddy’s Kong Quest” is more than just a brilliant pun, as this game took DK’s sidekick and put him into the spotlight. The big ape himself has been kidnapped by K. Rool, with the villainous crocodile now going by the monicker of “Kaptain” to reflect the new pirate motif of his minions. DKC2 retains the tag team style gameplay of the original, however, as Diddy is now paired up with his girlfriend Dixie Kong. Though Diddy and Dixie are closer in size and appearance than DK and Diddy were, they are actually more distinct gameplay-wise. Diddy retains his faster movement and farther jumps, while Dixie – the most useful Kong to this day – can use her ponytail to glide and make her landings precise. An addition has been made to the tag team setup, as Diddy and Dixie can now climb on each other’s shoulders for team-up moves, with the currently-controlled Kong able to throw their teammate to defeat enemies or reach places that are otherwise unreachable. The addition of Dixie and the team-up moves add extra layers of depth to the experience, and makes the gameplay stand tall over its predecessor. Then there are the Animal Buddies, who are more versatile and instrumental this time around: Rambi the rhino returns with a new charge attack, as does Enguarde the swordfish with a similar new move. Squawks the parrot has seen a complete overhaul. No longer confined to holding a light on a single level, Squawks is now big enough to carry Diddy and Dixie in his talons and fly to great heights, and can spit projectiles at enemies. Winky the frog has more or less been replaced by Rattly the rattlesnake, who betters his predecessor’s jumping capabilities. Then there’s Squitter the spider, who can take out enemies from a long distance and create platforms with his webs. 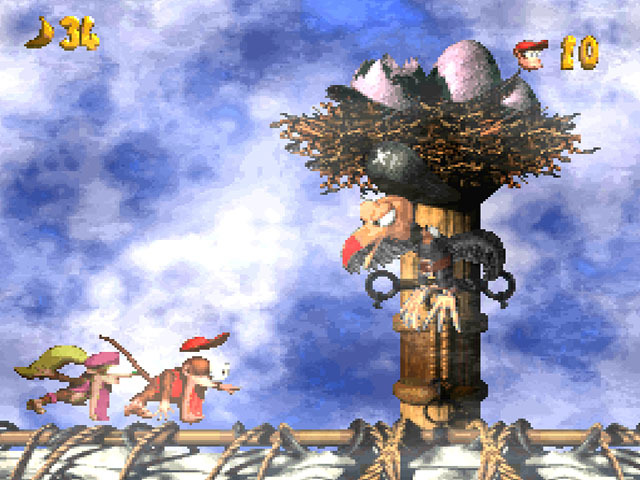 Though the Animal Buddies were fun in Donkey Kong Country, their inclusion feels far more integral in Donkey Kong Country 2, with entire levels being dedicated to their mechanics. Donkey Kong Country was a success in large part due to its visuals, which were a revelation in their day. 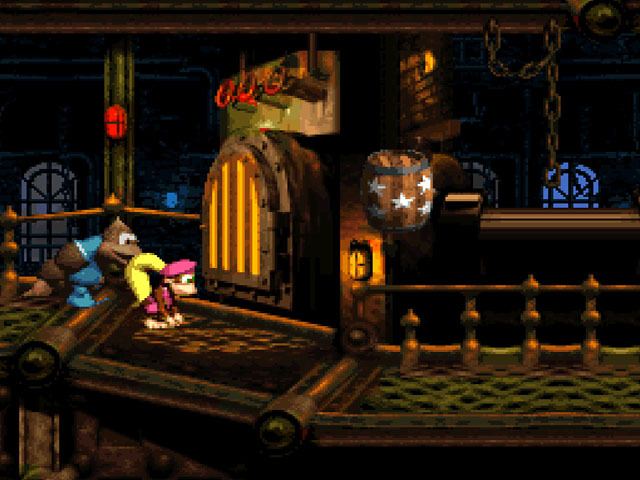 It shouldn’t be a surprise that DKC2 upped the ante in this area, with a wider array of colors, more detailed backgrounds and visual effects, and even more fluid character animations. But the technical advancements are merely a bonus, as the art direction proves to be the game’s real visual treat. 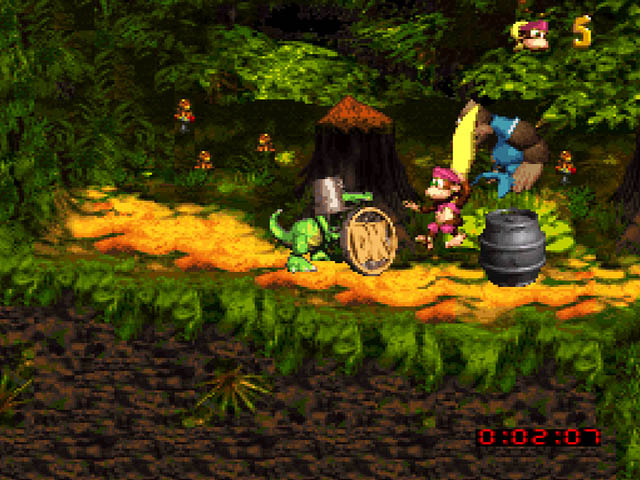 Whereas the action of Donkey Kong Country took place on Donkey Kong Island, with locations that were to be expected from a platformer starring simians – such as jungles, forests and snowy mountains – the adventure of Donkey Kong Country 2 takes place on K. Rool’s home turf of Crocodile Isle, which serves as a dark, gloomy, and melancholic contrast to platforming norms. Crocodile Isle will see Diddy and Dixie venture across pirate ships, volcanoes, thorny mazes, giant beehives, and dilapidated amusement parks, to name a few of the game’s locations. Even when it uses familiar themed environments of the platforming genre, it puts new spins on them. When you make it to the game’s forest world, for example, it’s an haunted forest filled with ghosts and skeleton crocodiles. The game’s seven worlds usually have a primary theme, but are not restricted to them, with Rare wisely employing a variety of stages within each world. It’s in the levels themselves that the creativity shines brightest. There’s a sense of imagination stemming from every level that’s rarely approached in gaming, with every stage presenting new gameplay ideas that still feel fresh and original today. Many levels are built around a unique hook, like controlling your jumps through gusts of wind or racing a series of Kremlings on a roller coaster, that are utilized to their fullest and then gracefully left behind after their level is done. 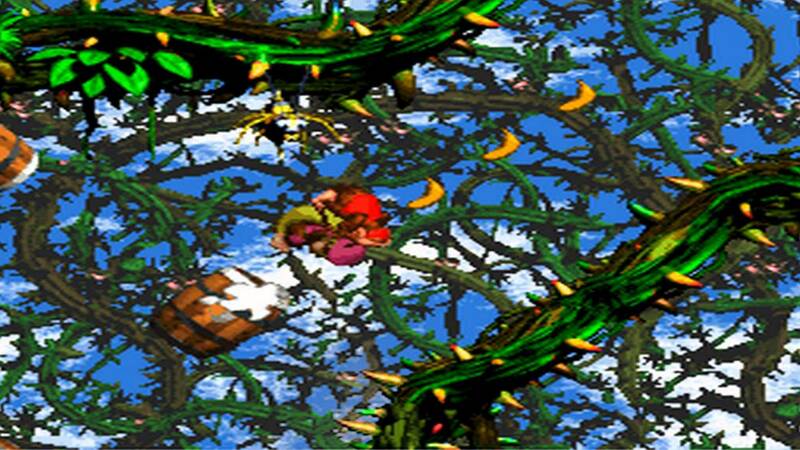 Every stage of Donkey Kong Country 2 is swimming in creative ideas, and the game knows better than to let even one of them overstay their welcome. The boss fights greatly benefit from this new sense of creativity. Where the first game enlarged regular enemies, had DK and Diddy bounce on their heads a few times, and called it a day, DKC2 instead presents a more varied and challenging rogue’s gallery of big bads, with even those that fall under the “big enemy” category bringing a unique challenge to the game. 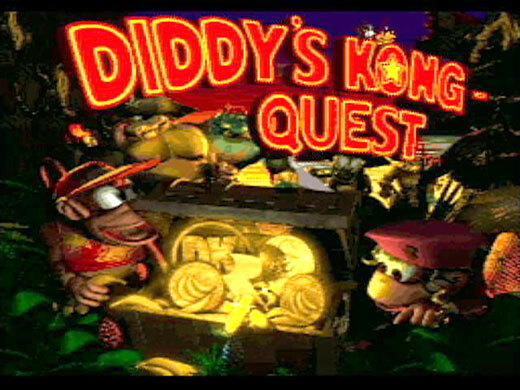 Though Donkey Kong Country was always a challenging game, it was here that the series became known for its great difficulty. Each world of DKC2 is considerably more challenging than the last, and a host of secret levels are among the toughest obstacle courses in any platformer. But never once does the game feel unfair. The challenges stack up reasonably, and continue to grow as you get more accustomed to them. The difficulty curve is pretty much perfect. 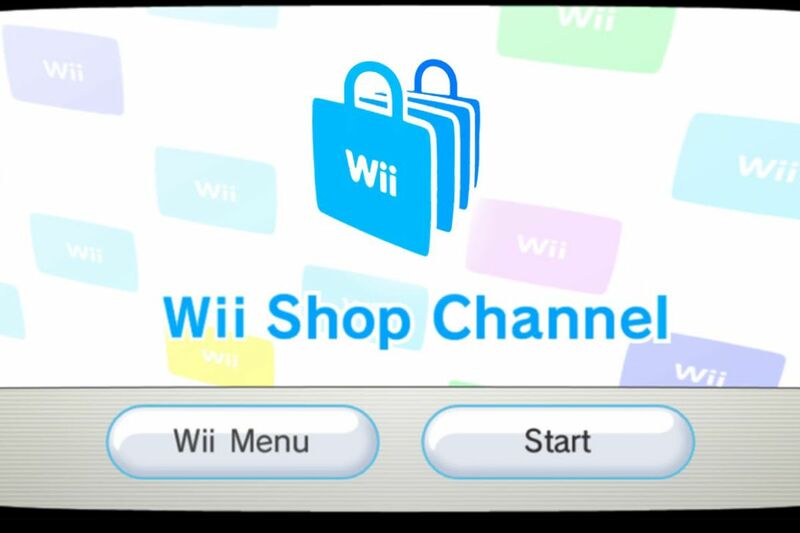 Additional challenge and depth has been added through the game’s collectible items. Though bananas, balloons and the K-O-N-G letters all return to give Diddy and Dixie extra lives, the new items have a greater range of uses. Banana Coins are a common new item, and are used as currency for the Kong characters who appear on the world map: Cranky Kong gives tips on the levels’ secrets, while his wife Wrinkly Kong saves your progress and gives advice on the game’s basics. Funky Kong can take you to any previously visited locations, and the aptly-named Swanky Kong hosts a quiz show that gives Diddy and Dixie the chance to earn multiple extra lives. The two big new collectibles in the game, however, are the Kremkoins and Donkey Kong Coins. 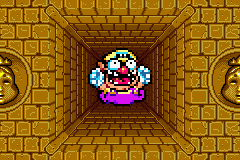 The Kremkoins are won in the game’s bonus stages (every level has one to three), and are traded to a Kremling turncoat named Klubba for access to the Lost World, where the aforementioned secret levels await. Fifteen Kremkoins are required to visit each level within the Lost World, which makes hunting down and completing the bonus games a much more worthwhile and rewarding endeavor this time around. Every level in the game also houses a single Donkey Kong Coin, which must be located in order to obtain a full one-hundred (and two) percent completion (as well as earn the right to be called a video game hero by Cranky Kong). Getting through the game itself is already a great challenge, but if you’re going for full completion, Donkey Kong Country 2 remains one of the toughest games to appear on a Nintendo platform. Donkey Kong Country was already a platformer with a strong sense of atmosphere, and this is but another category in which the sequel outshines it. I’ve already touched on the visuals and art direction, but what really gives DKC2 its unique soul is its soundtrack. The music of Donkey Kong Country 2 is composer David Wise’s opus, and combines memorable melodies with ambient sounds that give the game a mood that’s all its own. The music of DKC2 perfectly captures the sense of urgency of this quest to save a fallen hero, while also reflecting the game’s often dreary environments beautifully. The soundtrack works in a wonderful contrast to that of the first game, with the more swanky and energetic score of the original being replaced with more somber and menacing tunes (you need only to listen to the tracks that accompany the world maps of both games to understand the drastic change in tone). In one of the game’s subtle works of brilliance, the most beautiful and soothing tracks usually accompany the most difficult stages, which encourages you to keep trying your hand at them in hopes of triumph, instead of giving up on them in a fit of rage. Despite how appropriate each track is to their location, this is also a soundtrack that can very much be enjoyed as its own entity. As great as the soundtrack to the original Donkey Kong Country was, the soundtrack to Donkey Kong Country 2 is that much greater. Donkey Kong Country 2: Diddy’s Kong Quest is one of the best and most creative platformers ever made, and a perfect example of what a video game sequel should be. It betters everything its predecessor did right, while also correcting whatever missteps it had. And it does it all with a tone that is entirely its own, combining cartoony characters with a world and soundtrack that’s dark and melancholic. You won’t find many games that are built so strongly around such contrasts, and none that execute them better, or provide this much fun while doing it.